A certain rapper has had his career cut short. 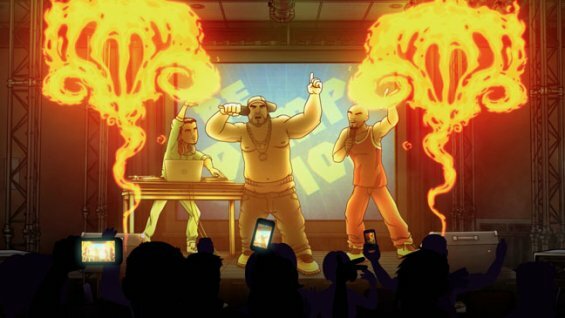 FX has cancelled Chozen after one season of 10 episodes. This animated comedy follows Chozen, a gay white rapper who’re recently been released from prison. He’s now got a new message and is on a quest for redemption, to claim his rightful position as the world’s top rap artist. Chozen stars Bobby Moynihan as the voice of the title character. Others in the Chozen cast include Hannibal Buress, Michael Peña, Nick Swardson, Kathryn Hahn, and Method Man. The series debuted in January to 946,000 viewers with a 0.6 rating in the 18-49 demographic. Viewership dropped about 30% in week two and got worse for subsequent episodes. The season finale on March 31st hit a new low with 451,000 viewers and a 0.3 demo rating. Though the cable channel is still committed to putting out original scripted content, the ratings were too low to mandate a second season of Chozen. What do you think? Did you enjoy the Chozen series? Do you think it should have been cancelled or renewed for a second season?